On January 3, 1791, Ann Arnold walked into the newly founded Slater Mill and onto the pages of history as one of the first nine employees hired by the mill. She was probably about ten years old. As the industrial revolution swept across the western world, many factories, including Slater Mill, capitalized on child labor. Pliable young children could be easily taught the skills needed to operate the mill’s spinning frames, could be paid less than adults, and were less likely to incite trouble than adult workers. Some factories hired children as young as four years old. 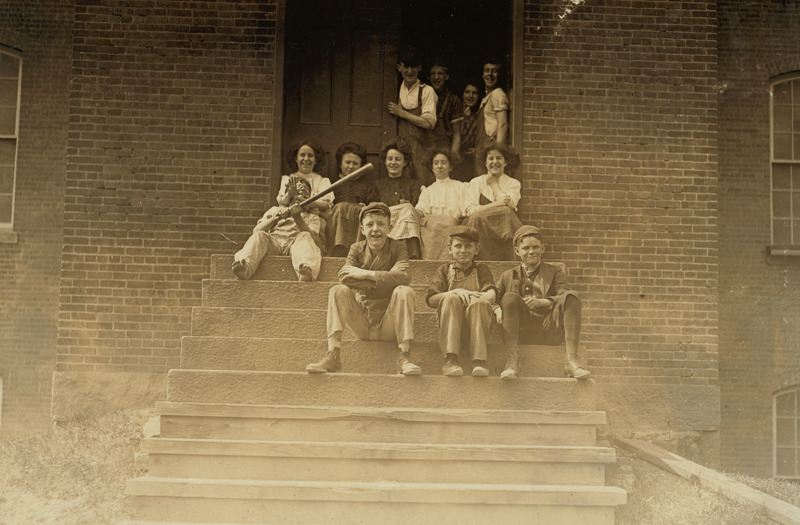 At Slater Mill, Ann Arnold joined a workforce made up of boys and girls between the ages of seven and twelve who worked six days a week – twelve hours a day in the winter, sixteen hours a day in the summer. They spent more than twice the amount of time that today’s kids spend in school working at the mill each day. Ann Arnold and her fellow workers picked cotton clean and worked the mill’s carding and spinning machines. The roar of the Blackstone River and hum of the water-powered machinery filled the air. Fine cotton lint coated the floor, clung to the workers' clothes, and clogged their throats. If the mill supervisor thought the children were not working hard enough, the children were fined, further reducing the small paycheck that they took home each week. The children were expected to spend Sundays, their one day of rest, at a mill-sponsored Sunday school where Brown University students provided basic schooling. For her hard work, Ann Arnold brought home a regular salary: a luxury compared to farm life. The rest of her family toiled all day on the family farm, working just as hard as Ann did in the factory, but without the assurance of a regular paycheck. As Slater Mill expanded, more workers were needed to run the carding and spinning equipment. Mill operators adopted the “Rhode Island System” of labor where entire families were hired to work together in the factories. Nonetheless, children remained a key source of labor. In 1830, fifty-five percent of all millworkers in Rhode Island were still children. Long after Slater Mill closed its doors in 1895, child labor continued to be a contested issue. In the early 1900s, organizations such as the Consumer's League of Rhode Island fought to limit child labor. Early legislation restricted the number of hours that children could work and set age requirements for factory work – unscrupulous mill owners seldom enforced these rules. In 1938, the Fair Labor Standards Act made it illegal to employ any child under the age of twelve in the United States. However, children like Ann still work in factories throughout the world today, enduring harsh conditions to support them­selves and their family. 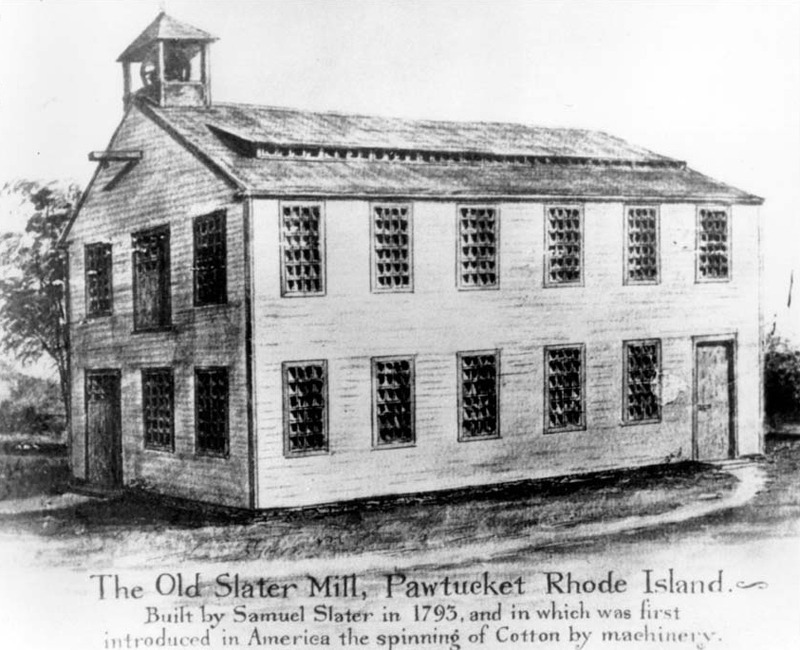 Old Slater Mill: This drawing from 1793 depicts Slater Mill as it would have looked when Ann Arnold and other children worked there in the 1790s. 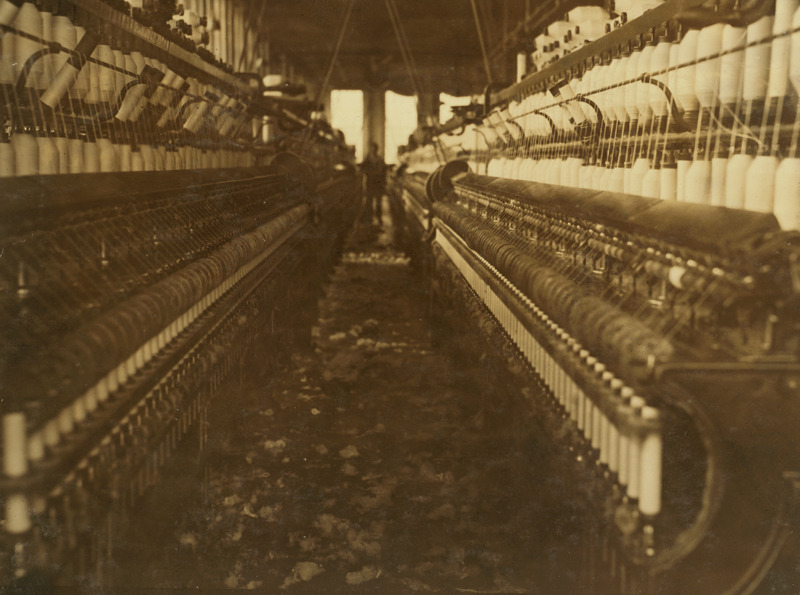 “View in a Pawtucket, R.I., cotton mill showing accumulation of lint on floor. The air is full of it too, but photo doesn't show it.”: This photograph was taken by Lewis Hine in 1912, while he was employed by the National Child Labor Committee to document child labor across the country. The photo’s original caption highlights how dangerous millwork could be – in addition to the dangers of hearing loss from the loud machinery, textile workers were at risk of developing serious respiratory diseases from the cotton lint that constantly filled the air. “Noon hour. Group of workers in American Yarn Mfg. Co., Pawtucket, R.I.”: While this may look like a rag tag baseball team at recess, this 1909 photograph shows a group of workers during their lunch break at the American Yarn Manufacturing Company in Pawtucket. Until the Fair Labor Standards Act significantly limited child labor in the 1930s, many children continued to work in Rhode Island factories, often alongside their parents or other family members. Amelia Grabowski, ““4 or 5 Active Lads to Serve in Cotton Factory”,” Rhode Tour, accessed April 22, 2019, http://rhodetour.org/items/show/30. Cameron, E. H. Father of American Manufactures: Samuel Slater. Portland, ME: Bond Wheelwright Company, 1960. Digital History. “The Introduction of the Factory System.” http://www.digitalhistory.uh.edu/disp_textbook.cfm?smtID=2&psid=3518. Hulton, Sandra and Jame Lehane. “Labor at Slater Mill.” http://web.bryant.edu/~ehu/h364proj/fall_98/hulton/Labor.htm. Korr, Mary. "Child Labor Explored in Mill Exhibit." Providence Journal. September 14, 1990. Kulik, Gary, Roger Parks, and Theodore Z. Penn. The New England Mill Village, 1790-1860. North Andover, MA: MIT Press, 1982. Tucker, Barbara M. Samuel Slater and the Origins of the American Textile Industry, 1790-1860. Ithaca, NY: Cornell University Press, 1984.